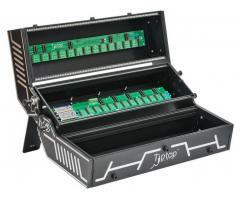 tiptop audio's station 252, state of the art mechatronics for electronic musicians. the folding case is made entirely of light weight materials and weighs about 13 lbs/5.8 kg. it is especially made to fit in an airplane's overhead compartment. the sizing is 84hp per console (row) for a total of 252 hp. there are two fold positions per console (row) for a total of four positions. 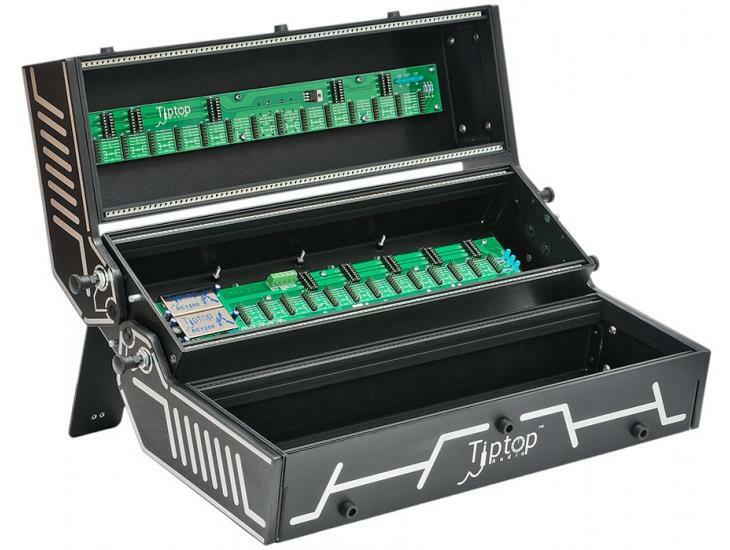 the station 252 uses tiptop's zeus studio bus, a monster universal power supply system supplying a total of 7200ma. compatible from 100-240v, it can be used worldwide just by switching the power cable. it uses 18 awg mil-spec wiring and has a brushed aluminum texture. there is a magnetic supporting leg holder. all pieces manufactured and construction done in the us.